Wolf Creek 2 is the sequel to the disappointing and amazingly dull Australian horror of 2005 Wolf Creek, which is another exhausting horror in which we see the predictable become even more predictable. Unfortunately I can’t say that Wolf Creek 2 takes a whole different approach, however it is slightly better, despite a problematic story for more than a few reasons, it provides gore, horror and a few thrills; taking the one positive from its original and focusing purely on replicating it. Mick Taylor (John Jarratt) is still roaming the Australian outback with his hunting knife and sniper, chasing down tourists making it an unsafe place, and one to be feared. After setting his sights on a German couple which he soon captures, he is then interrupted by Paul (Ryan Corr), an English tourist who when driving down the highway stops and picks up a blood covered and fearful woman (Shannon Ashlyn). Mick Taylor chases the “pommy” around the outback, destroying his car, invading his hideout before eventually being one on one within his torture house, but will Mick Taylor lose out on another kill once more. 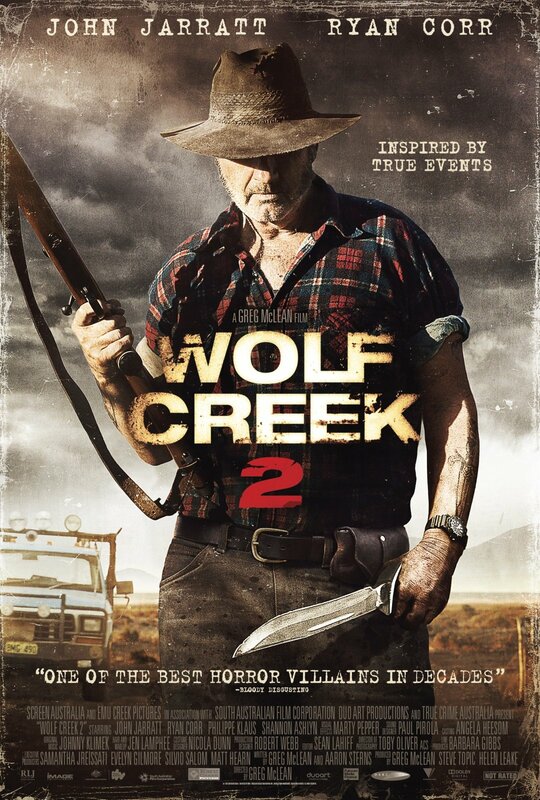 The most successful thing about Wolf Creek for me was Mick Taylor and it was a positive to see director and writer Greg Mclean spotting this and wanting to develop his outback slasher into a bigger and better sequel. However there is a huge problem, not only does this lead into a slightly repetitive and predictable storyline, but it creates an issue with the films message along with who the audience should be identifying with. The first half of Wolf Creek 2 is something which censorships would probably be worried about, as Mick Taylor kills of a few police officers, who were in retrospect being a little bit mean and harsh, he has a little “pig hunting” catchphrase producing laughs, and therefore making the audience side with him. His first victims then speak German, making them completely un-relatable to us as an audience whilst once again Mick cracks out his book of jokes; it takes far too long before Paul to appear for the audience to then realise that we should be classing him as the protagonist, instead of Mick Taylor. Now this shouldn’t really be an issue in terms of entertainment, but something which caught my eye as slightly risky writing by Mclean and Sterns. Wolf Creek 2 as previously mentioned is very predictable, however to cover-up this flaw, as much action as possible is crammed in to make it both thrilling and entertaining. In comparison to the original much more deaths occur and this time round they become much more extreme and gore-like, with bullets to the head and knives slitting throats. The chase between Paul and Mick is a real highlight and does provide some thrills with some fast-paced scenes, something Wolf Creek lacked. As Paul finds himself in Mick’s torcher den we see a host of dead guests, some still barely breathing and whimpering, and some cold, stuffed and made to act out scenarios, making Mick Taylor look like the sick sadistic serial-killer he told us he was within the original. John Jarratt’s portrayal of Mick Taylor is brilliant, his sniggering laughs and jokes are all very fun, although a problem of course, it does make for both a very creepy, but fun character. His performance was typified in the tortures scenes, as he quizzes his victim, reveals his intentions and whilst slashing and stabbing remains cool, calm and keeps on laughing. Ryan Corr is likewise good, practically unknown he handles his role well and gives off a reasonable performance. McLean’s direction isn’t anything special, the way he chose to shoot the death scenes for the police were a nice touch and a highlight. However Wolf Creek 2 did shine through its use of special effects and make-up with a lot of work obviously going into creating a host of dead bodies, guts and gore. Wolf Creek 2 isn’t anything great but is a slight improvement on its prequel. The horror manages to capture what it set out to, and that’s a gore-filled, thrilling experience focusing on a fun but deluded outback killer. However it doesn’t create anything new, exciting or unique with everything being seen and done a thousand times before, creating for me a very predictable and average watch. Wolf Creek 2 should be avoided if possible, but the experience of watching Mick Taylor might just make it slightly worth-while. Looking forward to this. Good review! I need to re-visit the first entry, though, since I barely remember it (except that it was intense in parts). I know that many horror fans are quite split on it. Thanks! Thanks a lot! It has a great villain in Mick Taylor which people love, looking at the bigger picture though its average once more!